Eat Your Ethics at Jonai Farms! We’ve said since we arrived to farm free-range pigs that we’re working on a transparency model, and we’ve been clear that anyone is welcome to visit and scrutinise our farming practices. Last Sunday we really put the model to the test by hosting our first Eat Your Ethics at Jonai Farms (as part of the wonderful Daylesford Macedon Produce Harvest Week Festival)- a real paddock to plate journey for our visitors as we took them on a farm tour, then onto the back patio for a butchering demonstration and barbecue of the chops and ribs they’d just seen me cut up. In keeping with our general life philosophy, we were keen to do everything ourselves, from bread to boning, scones to slaw. We greeted our ethical enthusiasts with platters of American-style scones - Jonai ham and cheese for the savoury palates, pumpkin scones for the sweet tooths, and plenty of plunger coffee, and a selection of black or garden-fresh mint tea. I explained the Jonai journey to be ethical farmers, and then we were off to meet the happy piggehs. We stopped at the empty nursery paddock, where we diligently bring every sow the week before she’s due to farrow after losing one entire litter to foxes out in the back paddocks. We now have five gilts in there all due to farrow within the fortnight - a story I’ll post soon. We walked our guests along the road we had built at the start of summer to ensure we have bog-free access to our growing herd, then showed them the five paddocks we’ve created out of one 8-acre paddock, plus the 9-acre paddock where Borg still reins supreme with his rotating bevy of beautiful Large Black sows. We’re now hard at work fencing to break that paddock into nine 1-acre paddocks for quicker rotation through winter, when the pigs turn the soil much more quickly. The aim is to rotate the pigs more quickly to ensure they improve the land rather than degrading it, which can happen from too much rooting or hard pack in the feeding areas. As we move them out of a paddock, we’ll seed fodder crops behind them, reducing our feed inputs and diversifying the pigs’ diet even further when we restock those paddocks a few months later. Back at the house it was time for the butchering demonstration. 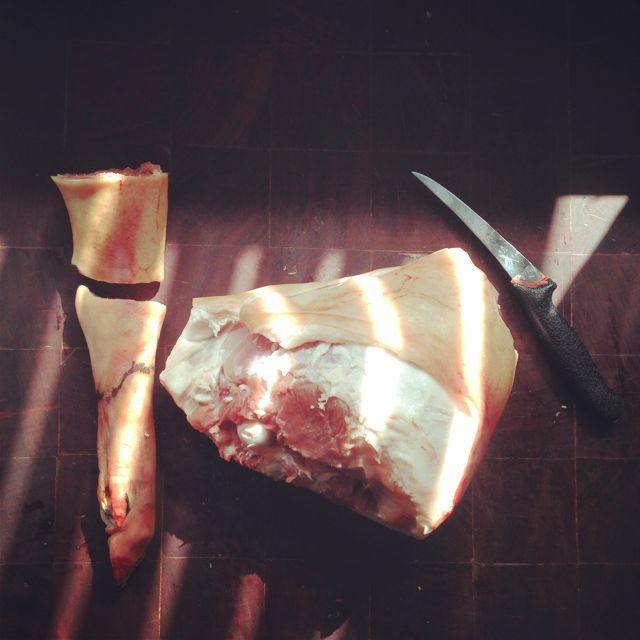 I’ve been apprenticing with our butcher Sal, who is generously teaching me the trade in preparation for setting up our own boning room here on the farm. Having now butchered (or helped butcher) six pigs and one steer, I’m getting the hang of it, but with a huge respect for the skills of this trade! I showed how to break half a carcass down into the forequarter, the barrel, and the hindquarter, then talked through the cuts, including a discussion of why muscle meat (the shoulder) is tougher but more flavourful, so very responsive to slow cooking for a fabulous result, whereas a rolled leg roast has less flavour, but is much more tender. I may have carried on too much about my preference for the shoulder, as we sold a lot of those at the end of the day, and not a single leg roast! There were great questions and comments throughout the day, such as when one person watched me bone out the ribs and exclaimed, ‘so that’s all the ribs you get from one pig?’ That’s right - just 14 per side, or 28 ribs per pig, and the first four or five are typically left on the shoulder roasts. And if you have loin chops, you won’t be having the full length of those ribs, and nor will you be having traditional Australian-style bacon, which includes the loin. Many people’s exposure to pork is predominantly bacon and ham, and plenty of others really only add ribs and chops to that repertoire. Many butchers will simply turn a lot of their shoulders into sausages to account for these preferences. While we love the sausages Sal’s been making for us (seriously, our bratwurst turned me back to sausages, and our new single estate pork and sage sausages with sage from our garden are delicious), we also want people to appreciate all the cuts, not just the primes. Most of us wouldn’t know what to do with a pig’s head, though many are comfortable with trotters and hocks. We’re lucky to have a great relationship with the wonderful Lake House here in Daylesford, who buys all our heads and trotters to make their sublime ‘Charcuterie’ entrée from our Black pigs - it includes a fromage de tête, a crumbed galette, rillettes, and a black pudding (that sadly isn’t from our pigs’ blood as we have yet to negotiate with the abattoir to secure it). 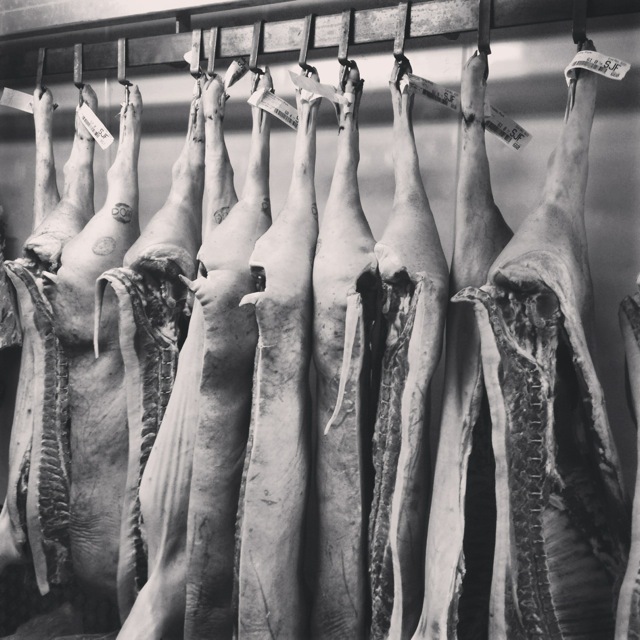 We are delighted to be making full use of the pig (we’ll work on the rest of the offal with the abattoir down the track), and to have our ‘uncommonly delicious’ ethical rare breed pork on such a distinguished and delectable menu! As the day drew to a close, everyone full of beautiful pork marinated in my secret American-style spicy bbq sauce, slaw made from kohlrabi, celeriac, fuji apples, red onion, chives and cabbage and dressed simply in olive oil, white wine vinegar, salt and pepper, roasted spaghetti squash direct from our garden, and my freshly made sourdough rolls, I think we all felt we’d eaten our ethics with gusto! Special thanks to my dear mate Bronwyn who came up from Melbourne to help the day run smoothly with her tireless efforts! Stuart’s generous parents then treated five tired but elated Jonai to a celebratory meal at the Lake House, where we not only got to taste the superior results of rare breed, ethical farming, combined with artistic cookery in the Charcuterie entrée, but an abundance of other beautiful dishes by the talented Lake House team in the warm, convivial setting Alla has created so well. Our brood were suitably impressed with this level of dining, just as the staff were suitably impressed with our brood’s sophisticated palates as they savoured everything from the fromage de tête to eel wrapped in pancetta, and of course left room for plenty of dessert! We’re already looking forward to hosting the next Eat Your Ethics, and sharing our passion for ethical farming and the finer skills of butchering with more people who can keep spreading the word about how we might best inhabit the planet lightly and deliciously. 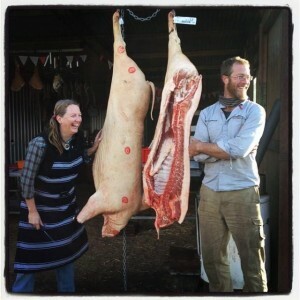 And if you want to support our efforts to shorten the supply chain and do on-farm butchery at Jonai Farms while being rewarded with plenty of uncommonly delicious ethical pork, check out our Pozible campaign to fund the project!